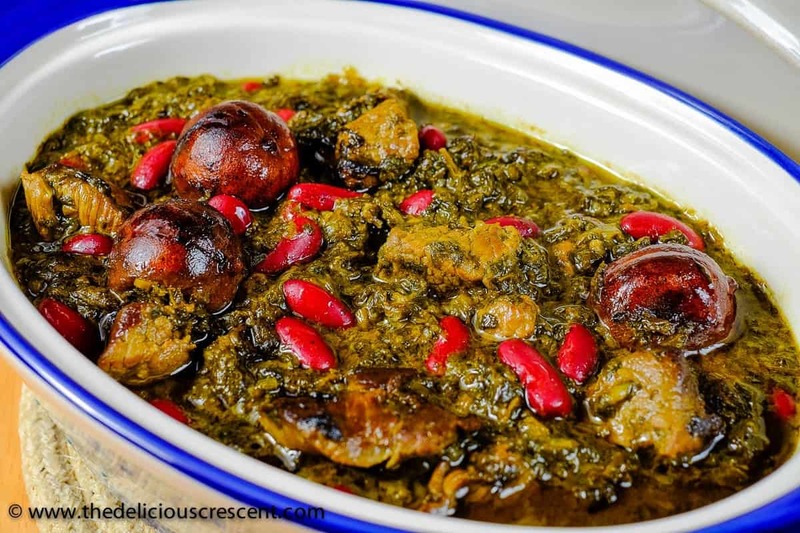 Ghormeh Sabzi is a stunningly delicious Persian stew that is served over steamed basmati rice. It has tender cooked meat in intensely fragrant, rich and lemony herb gravy with added kidney beans. This stew is popularly known as the national dish of Iran and is packed with protein and fiber. 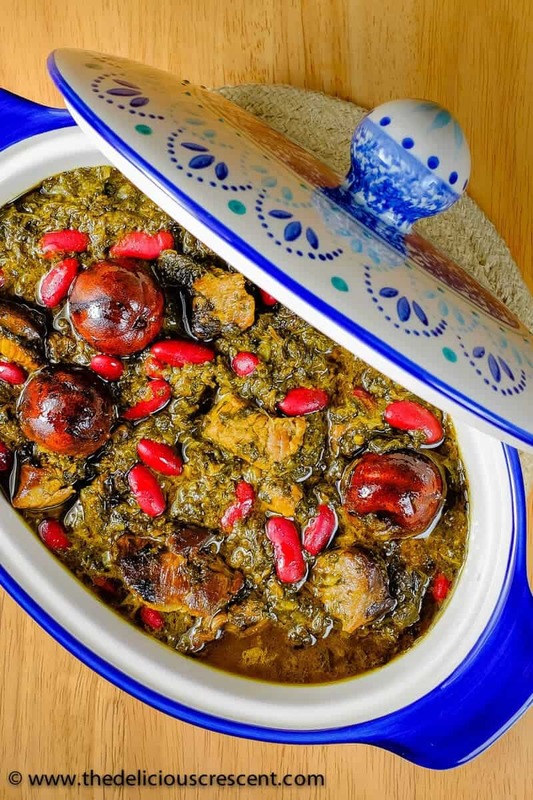 Ghormeh Sabzi, has garnered the reputation of being one of the most beloved Persian stews. Call it the “King of Persian Stews” or the “National dish” – no Persian restaurant menu or buffet is ever complete without this well deserved star item. There are certain things in life that are to be experienced in its pristine originality. And Ghormeh Sabzi is one of them. This ancient classic recipe involves the cooking down of a combination of herbs into a rather characteristic aromatic mélange. Meat, herbs, beans, dried limes etc. and you can find all these ingredients easily in your supermarket or online. 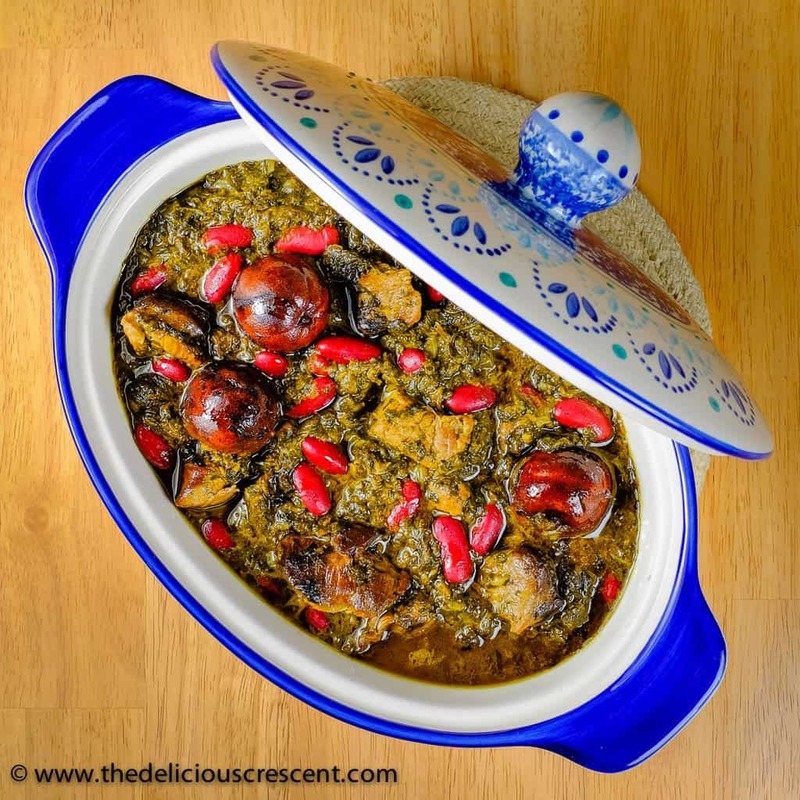 Persian Herb Stew is traditionally prepared with lamb, beef or veal. And whenever possible, I like to cook this dish with some bones along with the meat as I think that it imparts more flavor. Variation: I am a proponent of eating all that one enjoys, while keeping the principles of moderation and balance in mind. However, if you are longing to eat more of this addictive stew, you can also try it with chicken, fish and check out my tips below for making it vegetarian or vegan. If you use chicken or fish you will need to adjust the cooking time and water added. Add chicken in the last 45 to 60 minutes and fish in the last 20 to 30 minutes. Lower the amount of water to half. It requires parsley, cilantro, fenugreek and green onions. And it needs a LOT of the herbs. You can also check below how to use dried herbs for this stew. An especially key step in the preparation of Ghormeh sabzi is the slow and adequate sautéing of the herbs, that works the magic of emanating an aroma that will lovingly wrap you back. An essential herb is the Fenugreek, and like most recipes that use this herb, the dish tastes even better the next day after the flavors have had a chance to meld together. In Persian, Fenugreek is known as Shanbalileh. This herb is widely used in Indian cooking as well and available as fresh or frozen or dried herbs in Indian stores. You may also check in Persian or middle eastern stores. This is so important for the taste of ghormeh sabzi. You can find these at Persian or middle eastern stores or online. I have even been able to dry lime or lemon slices in my dehydrator. But go for the dried limes as they are fairly easy to get. The dried limes are pierced and added in the whole form to the stew, which gently release the juices and aroma to the stew as it it cooked. Dried Persian lime powder or fresh lime/lemon juice is also added. So the three key flavor elements for ghormeh sabzi are: roasting of the herbs, fenugreek, dried limes. In Persian, ghormeh means “fried” and sabzi means “herbs”. Since I typically write about the nutrition potential of an ingredient in my posts, today I am choosing to write about Parsley. For information about other ingredients, please follow the highlighted links above. Parsley has often been relied upon in the form of a garnish to enhance the flavor or appearance of a dish. But here it is one of the star ingredients of this Persian Herb Stew. Is Parsley Good for You? Parsley is a pretty nutritious herb. It is quite rich in Myricetin, a flavonol that has been known for its chemo preventive, anti-inflammatory effects and also for the lowering of blood sugar and insulin resistance. This herb is also a good source of chlorophyll, which is effective in negating the carcinogenic effects of heterocyclic amines. Furthermore, Apigenin is a bioflavonoid found in parsley, that has shown promise in cancer treatment. And parsley is super rich in vitamin K and therefore supports bone health. It is also a good source of vitamin C and vitamin A. You can simply increase the amount of beans to replace the meat. Other options are to use grilled/roasted tofu or sauteed mushrooms. If you use canned beans add them toward the end of the cooking time. Also, if using beans or vegetables, make sure to lower the amount of water. I haven’t tried it, but you could perhaps try adding some boiled eggs. Just make couple of slits into the egg white portion and slide them in the last 20 minutes and simmer the stew. 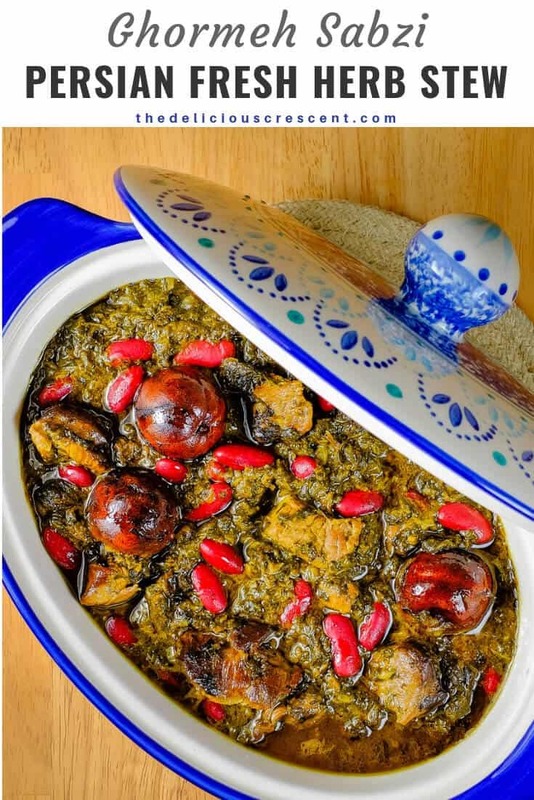 HOW TO MAKE GHORMEH SABZI WITH DRIED HERBS? I will be honest with you. I love making things from scratch and especially for this stew I use fresh herbs. I even chop up and freeze herbs in bulk. But I know people who make it using dried herbs and are pretty happy with the results. Sadaf is a popular brand that sells these and other Persian food ingredients. You can find them over at Amazon or Persian/middle eastern grocery stores. If using dried herbs, use about one fourth the quantity specified for the fresh herbs in the recipe. Take the herbs in a sieve and immerse in a bowl of lukewarm water. Soak the herbs for 20 minutes, drain and squeeze out the water. Proceed as you would with the fresh herbs. If using the ghormeh sabzi herb mixture from Sadaf, then follow the package instructions. Heat 2 tbsp of oil in a cooking pot. Next sauté the onions to a golden brown. Add the meat and brown it a little. Then add the spices, some salt, and 2 to 3 cups water and bring it to a boil. Lower the heat and simmer for approximately 30 mins. Meanwhile, heat two tbsp of oil in a nonstick skillet. Add the herbs and sauté for approximately 20 minutes until you can smell the aroma of sautéed herbs. Make sure to stir as needed. Alternatively you may mix the oil with the herbs and spread it out on a parchment paper lined baking sheet and roast in the oven at 375 degrees F for approximately 20 minutes. Stir in between. Then add the sautéed herbs, drained kidney beans and pierced dried lemons. Allow the stew to simmer for another 1 hour. Add the dried lime powder or lemon juice and cook up to half hour until the meat and beans are tender. Adjust the consistency, salt, lemon and other seasonings to taste. The stew should be thick and not runny. 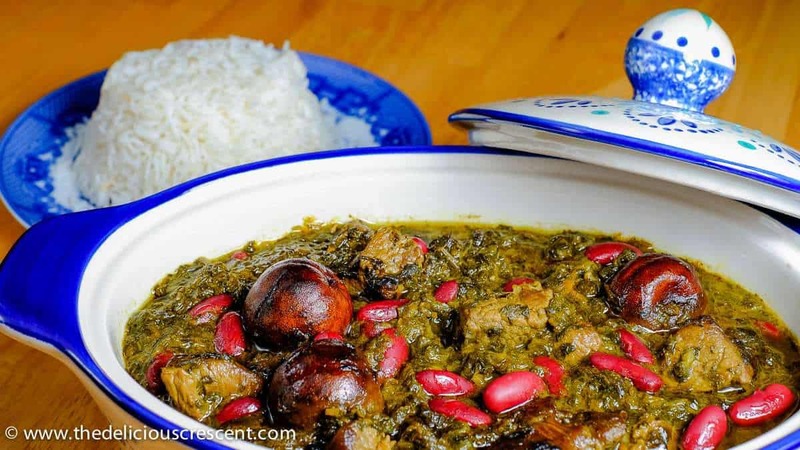 Serve Ghormeh Sabzi hot with steamed rice. Two things that can add bitterness to the stew if you are not careful are the fenugreek and dried limes. Don't add more than the required amount of fenugreek and especially if using the dried herbs. Add the dried whole limes, lime powder or lemon juice in the later half of cooking. The stew should be thick and not watery. When the herbs simmer for a while, they disintegrate into a thick stew, kind of like tomatoes cooking for a long time. But if the stew is a bit watery and if the beans and meat are already well done, then separate them out and evaporate the stew at a higher temperature, making sure to stir frequently. Then add the beans and meat back. It is best to start with water only as much as needed. If necessary, the kidney beans may be cooked separately for some time before adding to the stew. Also, lamb leg or shoulder with some bone works great for this Persian Herb Stew. Frozen fenugreek leaves can be found in Indian and Middle Eastern stores. 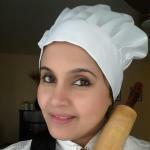 May substitute fresh Fenugreek leaves with 1/2 cup frozen leaves. Dried fenugreek leaves are available at Indian stores or online. It is best to use fresh herbs but may substitute with dried herbs. There are ready made mixtures of these dried herbs available at online stores under the name "Ghormeh Sabzi". MOST IMPORTANT TIP: Save some ghormeh sabzi for the next day. You will love this comfort food! For more tips and information check the blog post above. * Not including any added salt. Check for any added salt in other ingredients and adjust. Thanks Meme for your helpful and lovely feedback. I always love the leftovers! !